We assist clients in optimizing and globally harmonizing business processes, eliminating waste and reducing non-value-added activities. At TriRadial we believe in going beyond basic process reengineering to achieve what we call process-driven compliance. Compliance should be an enabler to the business, rather than a tax on the organization. 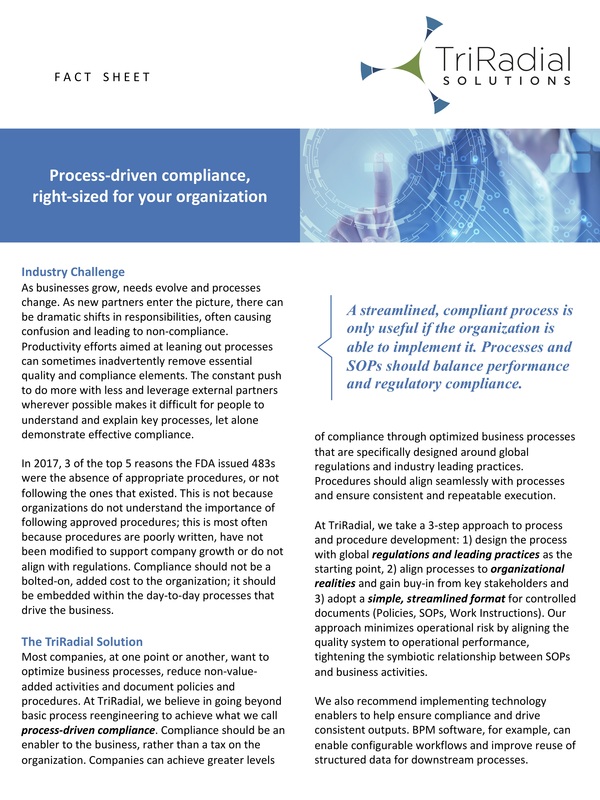 Companies can achieve greater levels of compliance through optimized business processes that are specifically designed around global regulations and industry leading practices. Operational risk is minimized by aligning the quality system to operational performance, tightening the symbiotic relationship between SOPs and business activities. Depending on the scope and goals of the effort, increased value can also be achieved through the addition of BPM software to enable configurable workflows and leverage data in new ways. Overall, our approach supports clients in producing predictable results, while increasing productivity & quality.